The growing trend for purchasing property in France, either as a main or second home, has led to a corresponding need for a book which explains the French conveyancing system for lawyers trained in other legal systems. French Property and Inheritance Law offers practical guidance to lawyers and other professionals advising clients on property transactions and related matters in France including: buying, selling, and mortgaging land; the ownership of flatsand leases; and the establishment of companies to own land as a means of avoiding French inheritance rules and to mitigate French inheritance tax. It unravels the mysteries of many features of the French system such as the marriage regime, the PACS, and sales en viager which can often be advantageous tonon-French clients. 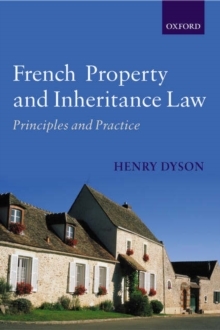 The book also covers all aspects of French inheritance law, including the rules of intestacy, the making of wills, and the inheritance rights of the surviving spouse and the rights of other members of the family. The author offers advice on how beneficiaries can avoid personal liability for the debts of a deceased and provides practical guidance on the administration of estates. A glossary and relevant legal precedents are also included. The author also writes regular updates on new keydevelopments in French property law - please see the publication Solicitors' Journal for details of his articles on the subject.